Ghost is a gorgeous blogging platform supported on Developer+ accounts on v6+ platforms. Ghost requires terminal access to deploy and hooks into Passenger affording simple process management. 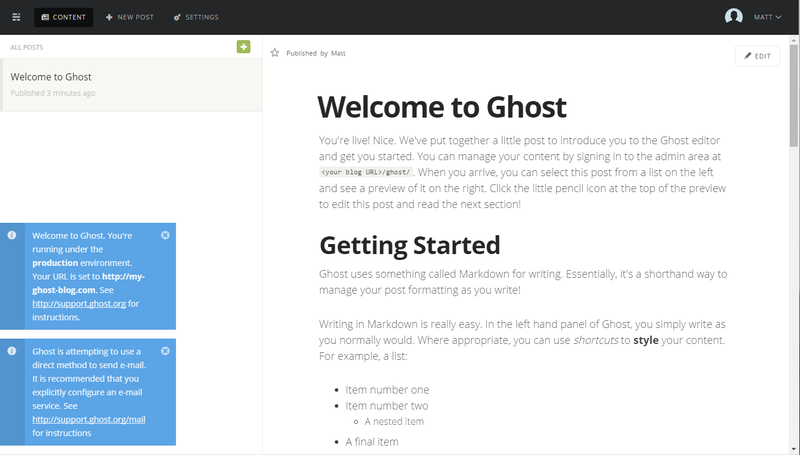 This guide is designed to get Ghost up and running with the fewest steps. Ghost will be SQLite as a database backend, but you might want to configure it to take advantage of MySQL’s improved throughput. Create a MySQL database. 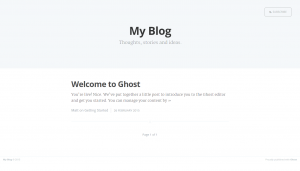 Ghost connects over TCP socket, so ensure that remote permissions on 127.0.0.1 are granted to the user. By default, when a user is created, permissions are only granted to “localhost” and not 127.0.0.1. Edit core/server/config/env/config.production.json with your database credentials. Change user, password, and database fields. Node.js piggybacks Passenger, and in doing so, can be easily restarted using the tmp/ control directory. Follow the general guide to restarting a Passenger-backed application. This entry was posted in Guides, Node and tagged blog, nodejs, passenger, terminal.